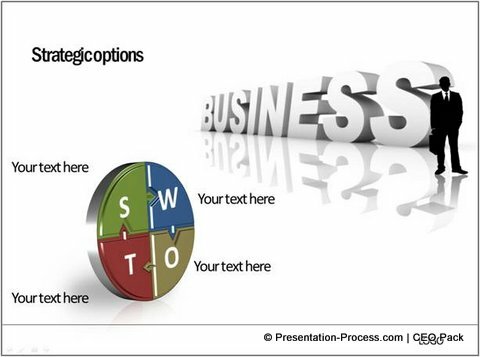 Creating a Business plan presentation? Discover some interesting and creative models to present your market analysis to your audience. When you create a business plan, market analysis template helps you understand your market from different points of view. It helps you evaluate your current position and judge your future potential. It shows you the direction to take and the dangers to avoid. There are many useful templates to help you make the analysis. In this article, we will explore 5 simple and effective models of analysis. 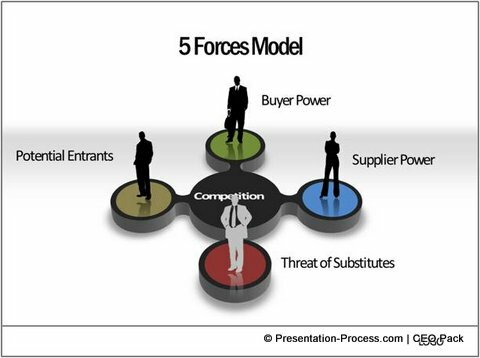 Michael Porter’s 5 forces model helps you evaluate the competitive strength and position of the business you operate in. The following template gives a quick overview of the 5 forces that operate in the market. You can use this slide as a guide post to explore each of the forces in detail in subsequent slides. PEST analysis helps you review your business from Political (P), Economic (E), Social (S) and Technological (T) perspective. The tool is usually used for strategic and marketing planning purposes. 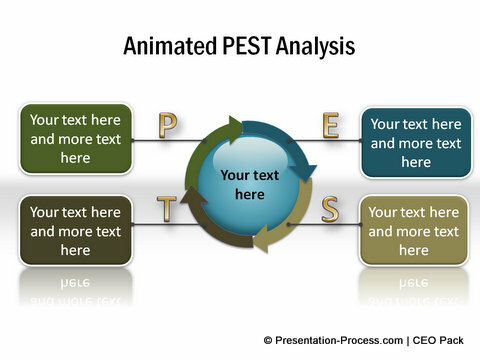 There are some interesting variations of PEST analysis. Some experts have added Environmental and Legal analysis to the earlier four factors and called the model as PESTEL. While PEST analysis is to evaluate market position, SWOT analysis is to evaluate a business or project proposition. SWOT refers to Strengths (S), Weaknesses (W), Opportunities (O) and Threats (T). The following market analysis template helps you capture an overview of the four elements. The visual at the background gives a context for the analysis. You can find more creative ideas for SWOT templates here. 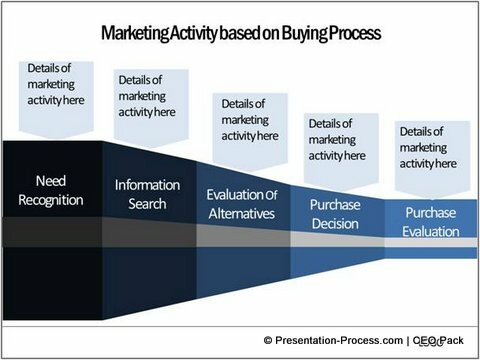 Once you analyze the market and business unit, it is time to analyze the customer’s buying behavior. You can explore more options to explain buying and selling processes here. As a business presenter, it is helpful to have a stock of useful templates in your templates library. The templates not only help you make better presentations, but also make you see your business from a fresh perspective. We realize that busy presenters like you may not have the time to create an elaborate library of high quality templates. That is why we came up with our ‘750+ PowerPoint Charts and Diagram Templates for CEOs’. The pack is a treasure house of useful templates to help you visualize your business ideas and concepts fast. For your convenience, we made all the 750 templates in the pack as fully editable. 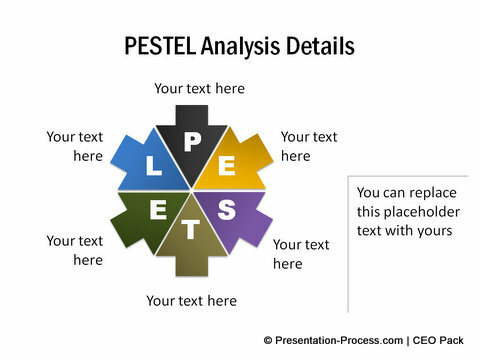 So, you can copy our diagrams to your slides and replace sample text, to create professional presentations in minutes. Why waste time creating your slides from scratch when you have such useful product available off the shelf?